An X-ray image of the sun taken with the Soft X-Ray Telescope on the orbiting Yohkoh satellite. Courtesy of Lockheed Palo Alto Research Laboratory. The Sun is the closest star to Earth and is the center of our solar system. 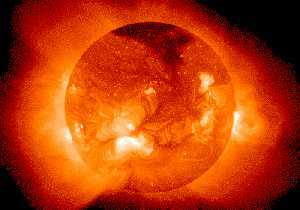 The Sun, an active star fueled by nuclear fusion reactions, displays sunspots, solar flares, erupting prominences, and coronal mass ejections.